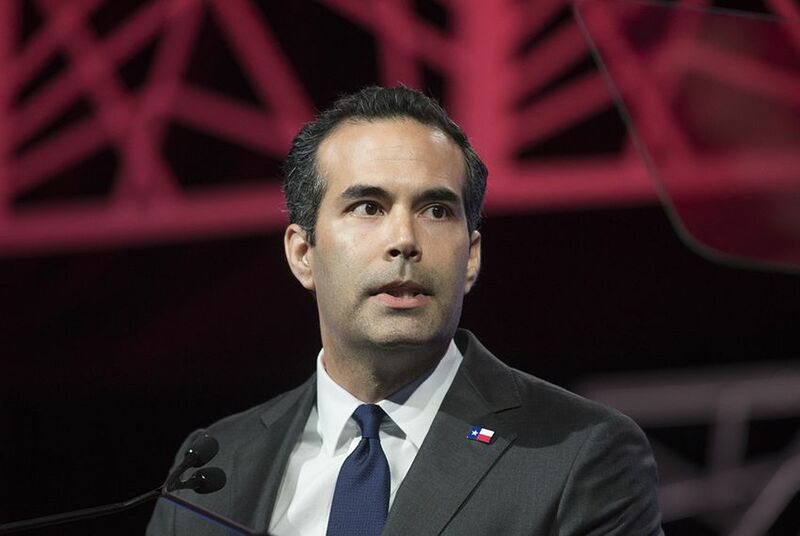 The Texas General Land Office, led by Republican Land Commissioner George P. Bush, signed a contract with Horne LLP for Harvey disaster recovery services on Oct. 30, 2017. Three days later, Bush received $27,500 in campaign money from Horne executives. No laws prohibit donations from employees of state government contractors, but the timing of the Horne money “sure looks like a big thank you,” said Dave Levinthal of the Center for Public Integrity, a nonpartisan group in Washington that tracks the influence of money in politics. Bush's political director Ash Wright said trying to tie the GLO's decision to Bush's donations amounted to "fake news." "The donations came after — not before — the contractor had been chosen," Wright said. "Commissioner Bush played no role in the selection of the contractor. And the donations represent a very small piece of Commissioner Bush's massive $3.3 million cash-on-hand." 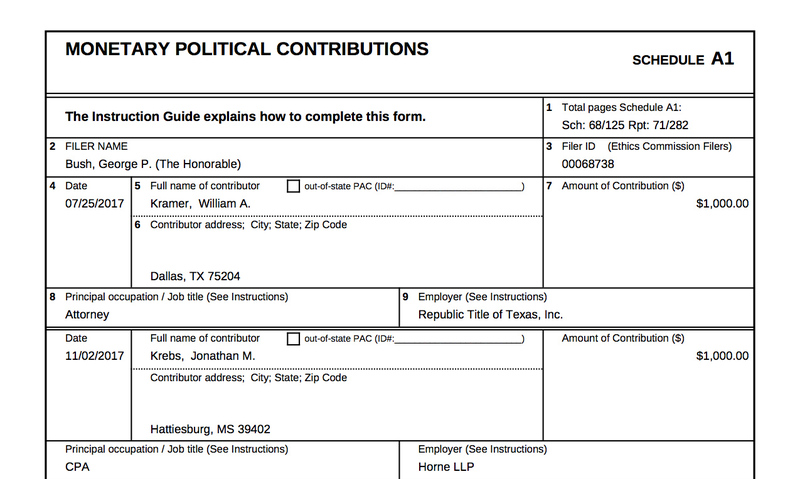 None of the donors reached by The Texas Tribune agreed to interviews about their contributions to Bush. However, Horne partner Jeff Aucoin, before referring the Tribune to a company spokeswoman, said he was not aware of the company’s contract with the GLO when he wrote a personal check for $500 to the land commissioner. Meanwhile, another Horne LLP partner, Kirk Hines, said he made his $500 donation “on behalf of the business” but otherwise referred questions to the company’s executive partner, Joey Havens. In an emailed statement, Havens said Horne LLP had provided disaster recovery services to the GLO in the past and noted that the contract it got on Bush’s watch was awarded after a competitive bidding process. Horne was selected as the best firm based on the scores of four finalists who responded to the land commission's request for proposals. In the internal selection process employed by the GLO, "experience and qualifications" counted for 25 percent of the overall score, "methodology and schedule" accounted for 50 percent and price accounted for 25 percent. Horne did not have the best price but did rank highest overall with 81 percent, compared to the next highest competitor, Witt O'Brien's, at 76 percent, according to figures provided by Bush spokeswoman Brittany Eck. "It is important to weigh costs of the contract with ability to complete the mission within the timeline expected," Eck said. "Our staff has been dedicated since the storm on helping folks return home, so that is our priority. What is going on in the political world is not something our staff is focused on." Bush’s Republican primary opponent, former Land Commissioner Jerry Patterson, noted that the contributions from Horne executives were among more than $370,000 worth of out-of-state campaign dough in recent filings and suggested the incumbent spend more time at home dealing with Harvey victims. "With tens of thousands still out of their homes maybe the commissioner should be doing his job instead of raising campaign cash in NYC, San Francisco or Washington, D.C.," said Patterson, who had $95,000 in the bank compared to Bush's $3.3 million at year's end. Patterson has made the GLO's Harvey response efforts a top issue in the uphill race to get his old job back. In early December, Patterson, faulting Bush’s agency for failing tens of thousands of homeless Texans, said the GLO had repaired only two homes at that point — a claim rated as “mostly true” by the fact-checking organization Politifact Texas. Bush’s office says the GLO is at the mercy of the Federal Emergency Management Agency, which oversees the use of federal housing repair funds provided to the state agency and solely determines eligibility for the programs. Wright, Bush's political director, shot back at Patterson in his response to questions about the Horne contract. He said the process used at Bush's GLO was far superior to the one used by his opponent. "In 2015, Commissioner Bush reversed his predecessor's practice (of) often giving out no-bid contracts," Wright said. "The new RFP protocol implemented by Commissioner Bush has made the GLO contracting process the most transparent and most effective it's ever been."